When I lived in the South several years ago, having lunch at a Meat and Three meant feasting upon an order of greasy fried okra, silky mac n’ cheese and buttery mashed potatoes while sitting at a slightly sticky formica table. Although it’s impossible to recreate the atmosphere of these restaurants (which is worth experiencing if you are not from the South), veganizing some of the food is pretty easy and worth a shot. I decided to keep the okra whole here and incorporated some chickpea flour in the breading to achieve a good crunch and golden color. 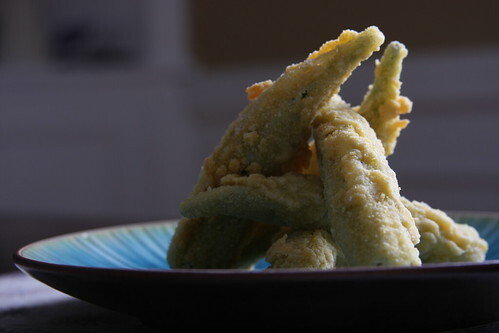 As soon as you remove the okra from the oil, a liberal sprinkle of salt is crucial to enhancing the flavor of the breading and texture of the okra. You’ll need 3 wide and shallow bowls, enough to accommodate the length of the okra. In one of the bowls, combine the soymilk and vinegar to create a vegan equivalent of buttermilk. Set aside and allow to thicken for at least 20 minutes. Throw the okra in the mixture to soak. In another bowl, combine the next four ingredients. Whisk your Ener-G and water in the third bowl. Heat plenty of the oil (enough to submerge the okra) in a small saucepan over medium-high heat. You can tell when the oil is ready by inserting a wooden spoon into the oil, touching the bottom of the pan: if bubbles form immediately around the spoon, your oil is ready. Working in batches, roll the okra in the buttermilk, then dunk it into the Ener-G mixture. Dunk it again into the buttermilk, then roll in the flour mixture, ensuring that it is well-coated. Slowly add the okra to the oil and fry for about 3-4 minutes, or until golden brown. Remove the okra and, while the oil is still wet, sprinkle it with some salt. Serve immediately. Wow, that looks amazing! I've never had fried okra pre-vegan, but this dish looks like I wouldn't miss it if I had!